An easy to learn game with a cracking theme and some gorgeous artwork, along the lines of the 'gotcha' game style. Everyone knows dragons like a hoard of treasure. Smaug had one, Fafnir had one, even Puff the Magic Dragon probably had a few gold coins and a goblet or two stashed away. But what happens when a dragon has kids? Do the grown-ups share with the little’uns? 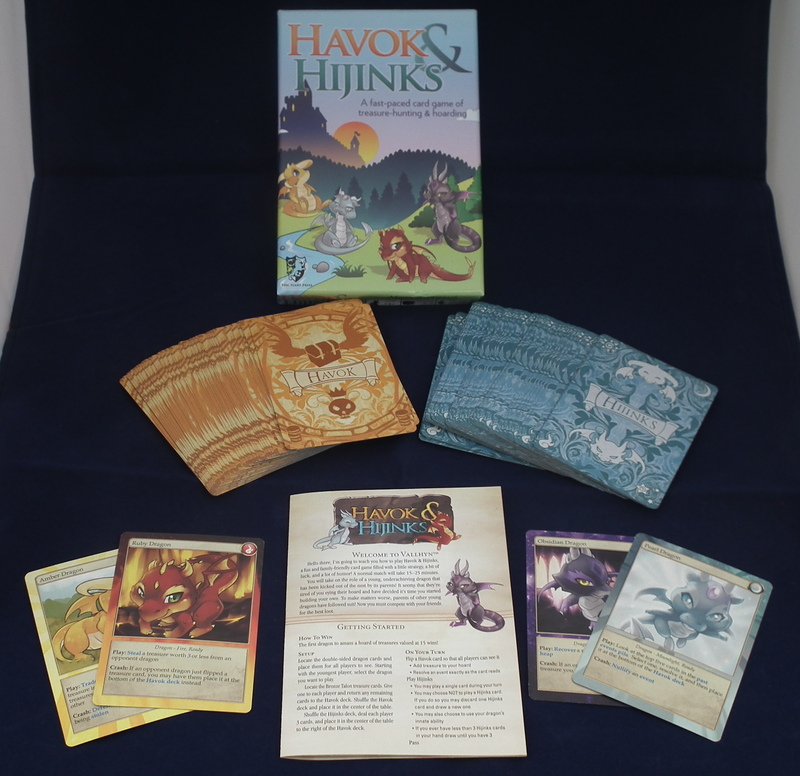 Well, Havok & Hijinks is the game to give you the answer! H&H places the players in control of a young dragon who’s been booted out of the family nest for giving mummy’s hoard the eye. The aim of the game is to accumulate treasure worth 15 gold; the kicker is that all the other players are also young dragons, and they’ll do anything to get their hoard together first! At the start of the game, each player is given one of four possible dragon cards and a hand of three Hijinks cards (see below). Each dragon has a unique pair of special abilities which the player can use during the course of the game and a unique affinity that affects how some of the Event and Hijinks card work (more on that later). The dragons are very cute! Gameplay is pretty simple. 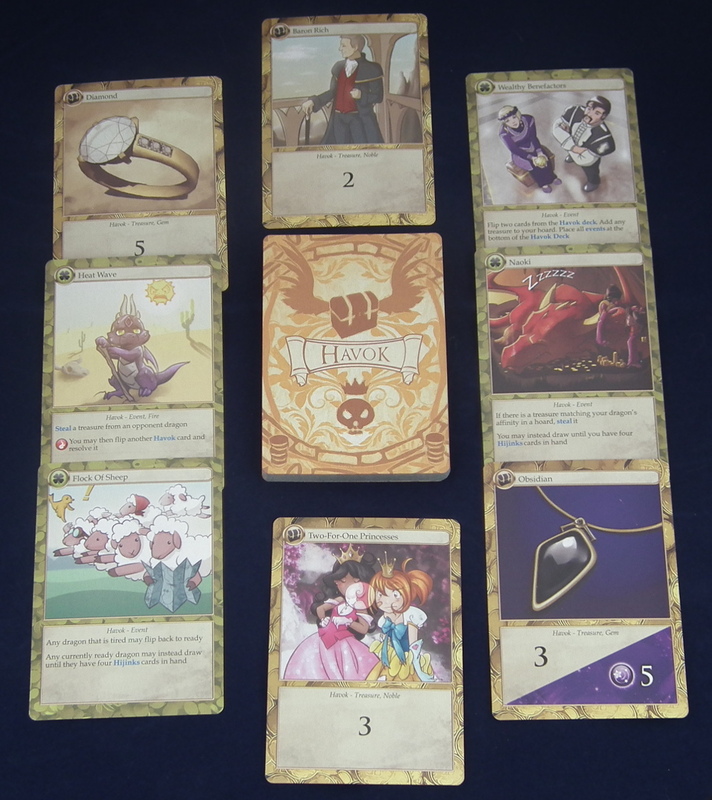 At the start of each player’s turn, a card from the Havok deck is turned over. The Havok deck is split into two different card types, Treasure and Events. If the card is a Treasure, the active player immediately adds it to their hoard. If it’s an Event, the active player performs what ever activity is written on the card. These can be breaking treasure in an opponent’s hoard, drawing more Hijinks cards or even stealing treasure. 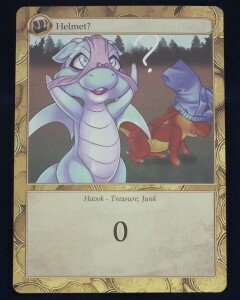 A player may also play a Hijinks card; these represent the dragons causing mischief as they attempt to steal, break or defend their own treasure hoards. These again come in two flavours, Plays and Crashes. A Play card can only be used during the active player’s turn. A Crash on the other hand can be played during any player’s turn (think of Instant Speed in Magic the Gathering), and generally works to counteract the activities of the other players. 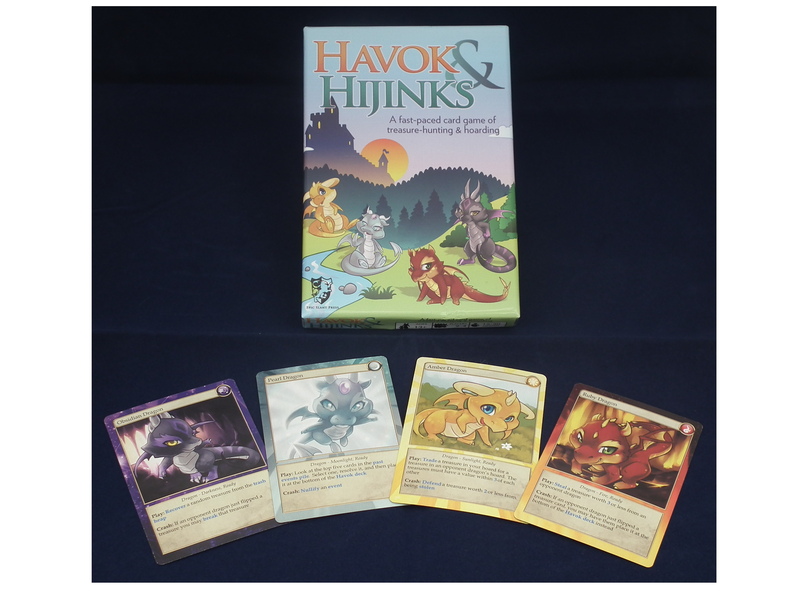 Whenever a player plays a Hijinks card, they immediately draw a new one, meaning players always have at least three in hand. If left unchecked, this system of mechanics would lead to stalemate after stalemate as players draw numerous answers to what everyone else is trying to accomplish. Fortunately, the designer has spotted this; players are only able to play one card in any given turn. This helps to keep the game within its predicted play time, plus demonstrates that plenty of playtesting has been done to keep the game smooth and flowing. Remember those dragon abilities I mentioned earlier? 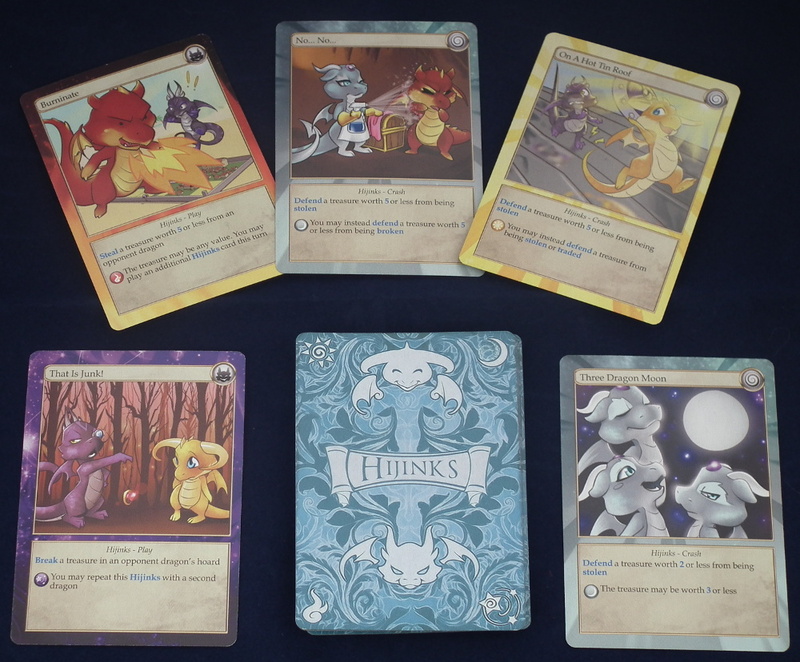 Well, these are split into a Play and a Crash, and work the same as the Hijinks cards except that, once used, they cause your dragon to be flipped to Tired, losing it’s abilities. However, each Tired side has a way for the dragon to be ‘woken up’. For example, the Obsidian Dragon wakes up when you break a treasure in another dragon’s hoard. The dragons therefore add a touch of uniqueness to each playthrough, giving the game replay value. Another element that adds a wrinkle to proceedings is the Affinities. Some Events, Treasures and Hijinks will have additional effects if the active player or the Hijink’s owner match the Affinity of the effect. 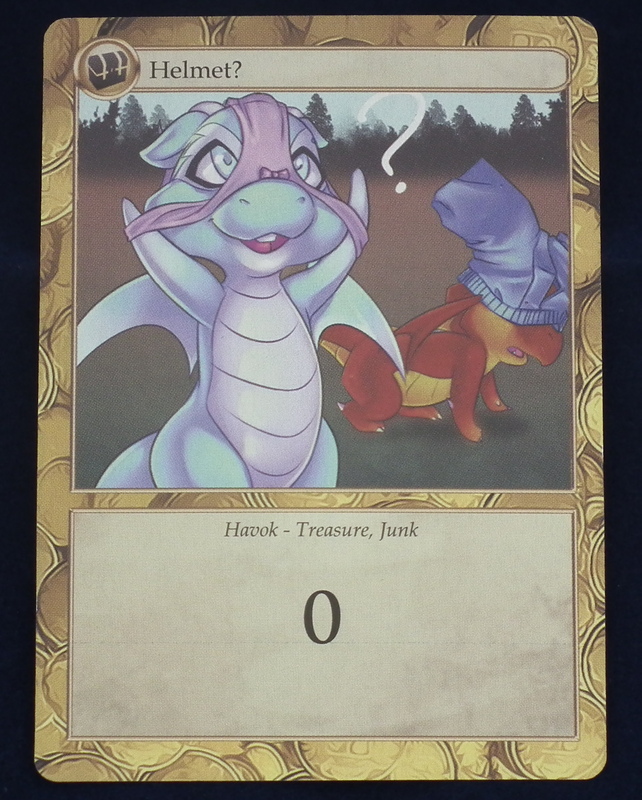 For example, the Hijink card ‘Hot Foot’ lets you steal a Treasure worth two or less, but if you’re the Ruby Dragon it can be worth up to three instead. What I loved about the Affinities is that each has its own gameplay aspect, so the Amber abilities tend to be about trading treasures and defending your hoard, whilst Obsidians tend towards breaking and recovering treasures. This pulls the game’s theme together beautifully, which is definitely one of the strongest elements of H&H. Definitely my favourite card in the game! So how does it play? Well, this is definitely a ‘gotcha’ game. With random Events, players having a secret hand of Hijinks cards and the dragon abilities, this is definitely a game where strategy is light. Now I’m not generally a fan of this style of game; Munchkin puts me in a rage no end! But H&H never purports to be anything else, and I love it for this. The box itself calls it “fast-paced, light strategy” and this is exactly what you get. H&H makes no bones about what it’s trying to be. The gameplay is light, fun and simple and the playtime is short enough that you can play several games in a evening if you fancy getting revenge on another player for some jammy play! 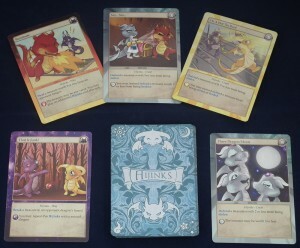 Unfortunately, with only 40 cards in each of the Havok and Hijinks decks, the game’s replay value could be compromised. Despite the randomness of the cards, and the four different starting dragons you can play as, H&H isn’t a game to base an evening’s gaming. But I don’t think that’s what it’s for; this is a game that’s been designed to fill the gap between games, or play in the background as you chat to friends. In this role, H&H is perfectly suited. The rule book is fairly well written, being clear to follow and explaining each of the basic mechanics logically. However, about half way through the Turn order is repeated in more detail; I can’t help but feel this should have been called ‘An example of play’ instead, as the Turn order is pretty clear from the details on the first page of the rulebook. The text is also very small, however this is more a symptom of the small box, and each page isn’t overloaded with text so it’s still fairly easy to read. Artistically and physically is where H&H really stands out. The artwork is cute and fun, with a complexity that matches perfectly with the theme. The colour palette is bright and engaging without being garish and cluttered. The cardstock is wonderfully thick, feeling solid in the hand yet shuffling with ease. The box itself is so solid you could probably hammer nails in with it. Altogether, the look is professional and thematic.